Anjali Kapadia runs her parent's sari shop in New Jersey's Little India. Her ambition, exquisite taste and eye for beauty has turned the family shop into a chic boutique. When economic pressures force the family to turn to their wealthy uncle Jeevan, Anjali never expected her uncle to arrive on their doorstep all the way from India! 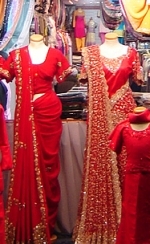 The sari shop gives Anjali, now widowed. the joy of life and sense of accomplishment. How can she possibly turn over control of something so special to her into the hands of an uncle whose troublesome reputation precedes him? To make matters worse, Jeevan arrives with a business partner, a Londoner Rishi Shah. Irritated that these men are watching and judging her every move, Anjali tries to prove her self while keeping her own vision of the shop. 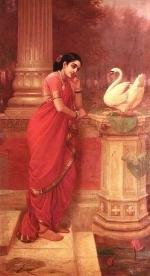 Wildly attracted to him on the one hand, and on the other, resentful of him overseeing every nuance of her business, Anjali feels torn within. Once she swore off love, but will Rishi find a way to break through her defenses and show her a world she never imagined, a world bigger than the dreams she ever thought possible? Shobhan Bantwal's THE SARI SHOP WIDOW is a delightful book through and through! Anjali is bright, independent and yet she has a side of her that is quiet, thoughtful and a little scared to live life to its fullest. Torn between the traditions of her family and her own desire for independence and contemporary values, Anjali is a woman with depth of spirit and an appreciation for others as she discovers how to incorporate the heritage and values of the Desi culture with her innermost desires. Rishi is a wonderful character that will steal the reader's heart alongside Anjali's. Quiet and thoughtful, he is a man with an inner strength. Although known for his power in the business world, he has a strength of character inside far beyond his boldness in the plans for the sari shop. Rishi has a steadfastness and a consistant non-presupposing strength of character that makes him grow on one naturally and more deeply as the story develops. Rishi's appreciation and knowledge of the sari shop fits in perfectly and flows naturally from the setting and characterization. THE SARI SHOP WIDOW touched me deeply. I carried this book with me everywhere, reading it waiting in the car and any spare moment. I haven't done this in ages but I just found myself wanting to return to the characters and the story. Every night, I looked forward to being able to return to the world of the characters. The older characters (in their 30s and 40s) were most refreshing. Anjali has the maturity of a woman who has experienced love and life before, and yet she still has a kind of vulnerability with which readers of all ages will find themselves easily identifying. Despite our different cultural backgrounds, I related so well to Anjali, understanding her and her dilemmas, hopes and fears. Shobhan Bantwal did an excellent job of portraying the particular Desi culture but also creating characters with a sense of universality so that readers outside of the Desi culture feel something in common with her characters. Shobhan Bantwal does an excellent job in creating a setting which draws the reader into the story and her characters. The richness of the colors and textures within the sari shop brings a vibrancy to the novel. THE SARI SHOP WIDOW is a must read for those passionate about Desi culture and neophytes alike. In THE SARI SHOP WIDOW, Anjali's family and their relationships are a dynamic part of the story itself throughout. Each and every character adds a rich depth to this story. The romance reaches beyond the hero/heroine focus to influence others. Jeevan and Rishi's arrival turns everything on its head as Anjali's family scrambles to accomodate the visitors, but by the story's end, every character's life is enriched and transformed. THE SARI SHOP WIDOW is a wonderful, wonderful work of fiction that will add a new perspective and inner joy to a reader's heart.